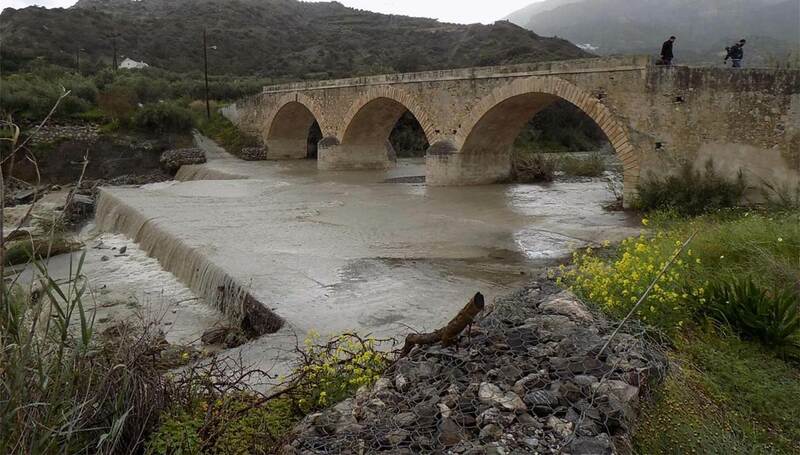 The Saturday floods that took place in the eastern part of Crete threatened, among other things, the old stone bridge located in Myrtos. The fate of the 130-year-old building raised concerns not only of the residents, but also of local authorities. Everyone was afraid that this bridge would share the fate of the bridge near Alikianos, which was destroyed by the previous flood. However, everything indicates that the bridge in Myrtos will survive and it will be possible to save it. The latest film recorded here shows that the water level has dropped, and the current of the river has calmed down. Experts emphasize, however, that due to the washed foundations, the durability of this building is significantly strained. Any subsequent violent weather phenomenon can be a real threat to the Myrtos bridge. In the film above, you can clearly see the erosion of the reinforcement located on the south side of the bridge. Most of the concrete threshold has been destroyed by flowing water. Bridge in Myrtos - view after the first downpours. In the foreground a concrete threshold protecting the foundations. In the picture visible on the top, which was made a few days ago, after the earlier downpour the first damage is visible. However, the foreground clearly shows the still existing concrete structure that protects the foundations against being washed. Looking at the film, it is easy to notice that today there is a deep hole created by water in the same place. Securing the bridge will certainly require a thorough repair work with the use of heavy equipment. We keep our fingers crossed so that the local authorities will be able to do this before the next heavy rains come.